* Please link back if you are joining me so people know where you are partying! 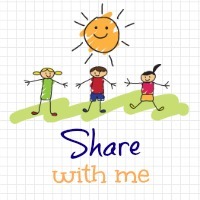 Welcome to the ‘Share With Me’ blog hop Week 38! It’s an honor to see that some of you have become regulars here as well as fresh faces each week. Thank you for those that joined in last week. I am really enjoying getting to know more of you and your lovely blogs through your posts. Without further ado my favorite link up was from the amazing Le Coin De Mel – Fundraising for Allergy UK . It’s such a great cause and very close to her as well as myself. If you missed it, you have to check it out here! Thank you so much. I was having trouble with twitter last night i was going to tweet it was this weeks favorite. I did pin it to the Share With Me favorite board too! Welcome Louise, fantastic to have you here and linking up. I love to get the chance to get to know other bloggers and their amazing blogs. I look forward to reading your post and hope you enjoy it and see you again soon. You too darling and thanks for the linky support. Thanks Joanna and welcome. I am glad you like. I love getting a chance to read various blogs all in one place. Look forward to your posts.